I realize that I could have started with a pot roast roast, roast chicken, or roast beef, but in honor of supper club and our new dining room table, I decided to conquer a crown roast of pork. I called a local butcher a few days in advance to prepare the crown roast, and had a great experience in St. Louis with Kenrick’s Meat Market. What a beautiful and impressive presentation of a tasty cut of meat! 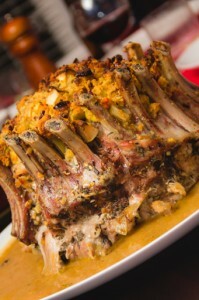 The crown roast was surprisingly easy to prepare and a great choice for a dinner party. The majority of my work in the kitchen was actually done a few hours before our guests even arrived!